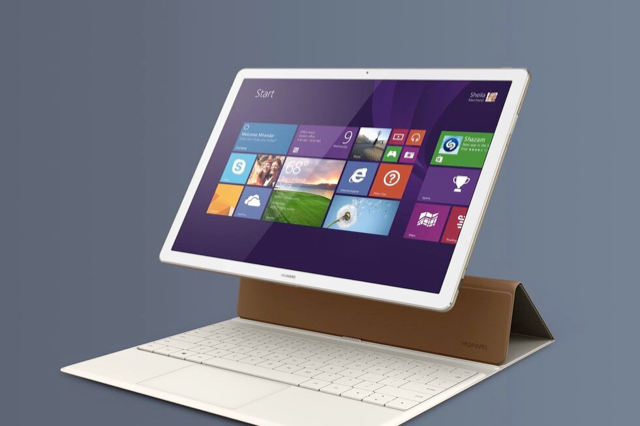 Huawei MateBook Tablet PC Surface Pro 4 Competitor. Discussion in 'Other Brands' started by alextrela182, Feb 21, 2016. Aman and thatcomicsguy like this. 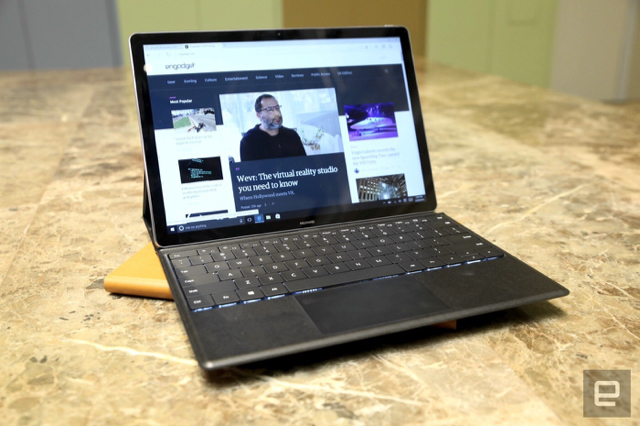 It's 6.9mm thick 640 g (1.41 lbs), and has a small bezel, 12" screen, 2160x1440 (3:2 aspect ratio), 400 nits, USB-C, fanless Core m (m3, m5 or m7), up to 512GB SSD , fingerprint reader, a stylus with 2048 pressure levels ($60), and built in laser pointer (what?!). Looks like you can opt for white or black bezel. Starting price $700. Also worth mentioning: super compact and lightweight charger, and a dock that looks kind of like an ipod mini that features ethernet, 2x full size USB, VGA, and HDMI. Quick comparison with the Surface 3: it's 3% heavier but has 12" screen vs. 10.8" screen, has SSD vs. eMMC, has core m vs Atom, is 20% thinner, and has a higher screen to bezel ratio. Not bad! The main question: which pen technology are they using? thatcomicsguy, darkmagistric and alextrela182 like this. With 2048 pressure levels and two buttons, it's probably another Wacom AES device. I like the new wrinkles that allow you to advance slides with the pen button and place a laser pointer in the pen's end. If they had a 10" option, I'd be buying it immediately. Don't get me wrong, the 12" one looks pretty compelling, especially with the relatively small bezels, but still. Though facial recognition support would be pretty nice, it's not a dealbreaker that this 'only' has a fingerprint reader. Added bonus, the reader is between the vol up / vol down buttons, so you'll actually be able to locate the volume buttons by touch unlike on the TP10. This really hits almost everything I want in a tablet. Super slim, 3:2, fanless core m, SSD, USB-C, slim bezels, bright, pen, fingerprint reader. All that's missing for me: a snap on 'smart cover' (no keyboard, just lightweight cover), microSD slot (not critical for me), and a pen silo or pen clip. And at 1.41 lbs it's still quite a bit heavier than the iPad air, but it's got a way bigger screen. Sound very good alternative proposal over competition. The only think I'm skeptical is that Huawei has not experience in the past with Windows device. It's her first attempt and that's the one reason I'm afraid I bit. But looks very promising without any doubt and hope continue to invest in the very high segment of Windows tablet and 2 in 1 device. Quick basic comparison with Surface 3 and Surface Pro 4 below. Most notable: about 20% thinner than both, and about 15% less weight per area. No kickstand though. On the possible plus side: seems like Wacom, which could mean better inking experience. Just saw a few of these videos pop up for this device and it looks REALLY nice. Is that $700 price confirmed, most of the videos I saw said pricing was yet to be announced. Pricing is confirmed, see here. Nice! Thanks. Is that with the keyboard? 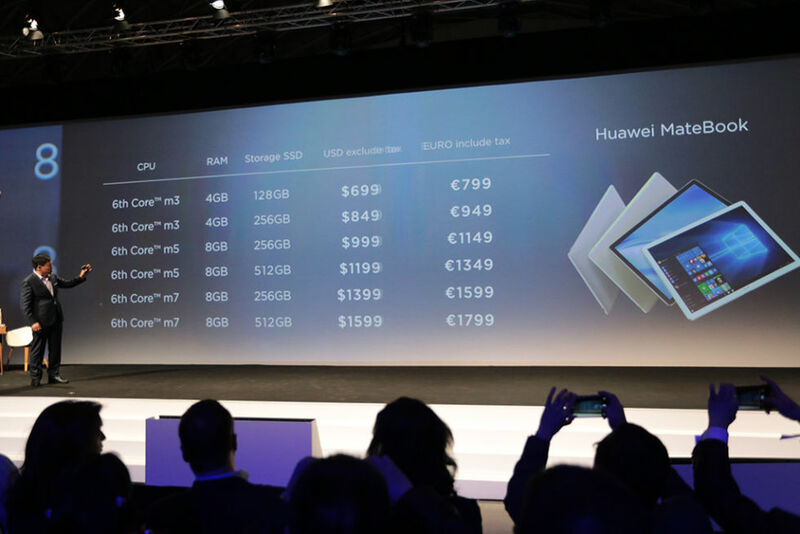 How do you feel about purchasing Huawei products?